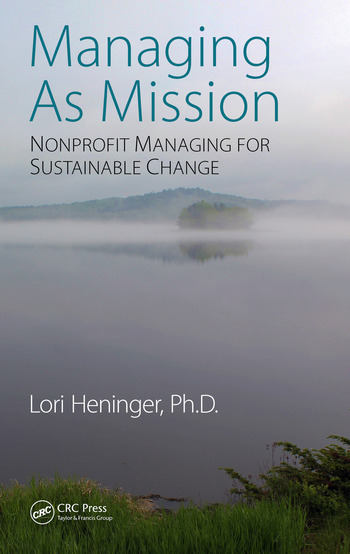 Managing As Mission pushes the boundaries of what it means to be a nonprofit manager by making the case that managing, as a reflection of the organizational mission – the cornerstone of any nonprofit – can bring about the change nonprofits were created to achieve: a better world for all. This book contains real-world examples, interview excerpts from nonprofit managers and directors, and a series of self-reflection and organization-wide tools to develop managers and managing as a mirror of the mission. Themes within this book include: a discussion of the history of nonprofit missions; management tasks and approaches; aligning values; building working relationship and trust; and creating organizational structures and interactions that mirror the organizational mission. It is written in an informal first-person style, utilizing humor that will, hopefully, allow the reader to see themselves in the examples and stories. Lori Heninger, PhDis an experienced senior manager and leader who has succeeded in moving organizations to their next level of achievement and growth. She has over 30 years’ experience in both non-for-profit and for-profit businesses. She is currently and independent consultant specializing in non-profit leadership and management, board and organizational structures, networks and alliances, and team-building with international and US-based perspectives. Lori focuses on the creation of effective, efficient organizational structures, advocacy and campaigns, managing to the organizational mission, development of leadership skills, and the creation of strong, united, mission-driven teams. Prior to that, Ms. Heninger worked internationally and in the US at both the grassroots and policy levels. Ms. Heninger holds a PhD in Social Welfare from City University, New York; a Master of Social Work from Columbia University and BA in Education from Kean College, Union, NJ.